Love Birds Celebration Plaque - - features two birds together on a wire enjoying the sunset. The understated elegance and silhouetted love birds make this personalized sign a perfect wedding or anniversary gift. 15" x 8" modified arch wall sign. Made in USA. The love birds and word Established are standard on this sign. 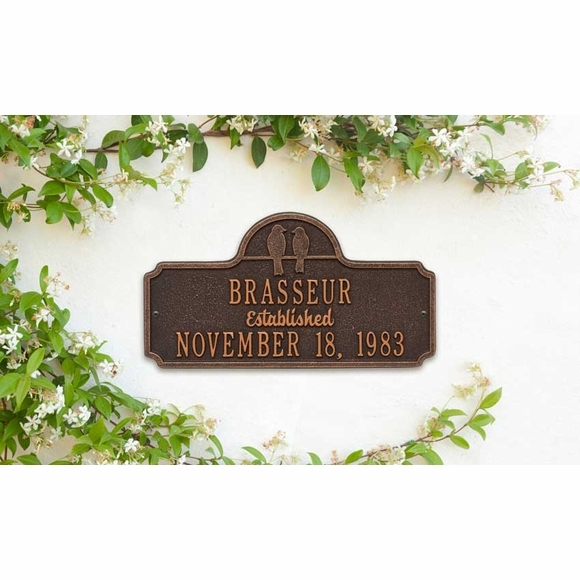 Personalized with the name and established date you provide. Line 1 holds up to sixteen (16) 1.25" characters. Line 2 also holds up to sixteen (16) 1.25" characters. Large image color is oil rubbed bronze. Smaller images colors (from left to right) are antique brass, antique copper, black/gold, bronze verde, oil rubbed bronze, bronze/gold, and pewter/silver. Dimensions: 15.0" x 8.0" x .32". Personalized wedding plaque / anniversary plaque with a pair of romantic love birds. Recommended anniversary gift wedding and wedding gift, too.